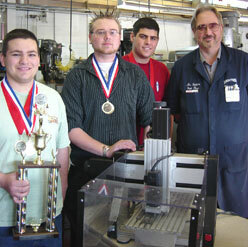 Has your school used a Techno CNC Router to make a winning design for an educational competition? Share your successes (first, second, third place) right here! 1) Complete EDUCATIONAL GALLERY UPLOAD and upload all information instantly OR..
2) Download CONTEST GALLERY RELEASE and fax it back to us at: (516) 358-2576 . 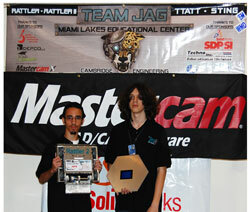 Congrats to Team Jag - Winners of the BotsIQ National Competition, 2010! Visit the Team Jag Web site to say informed! 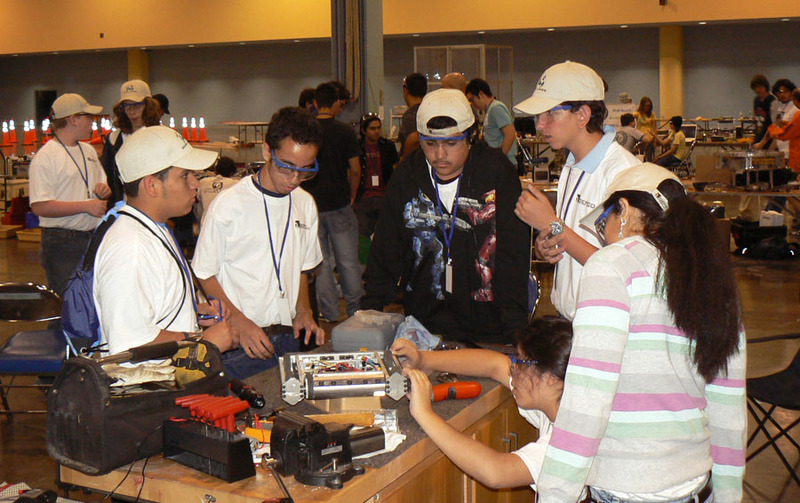 Team Jag is instructed by Mr. Paul Kynerd a Cambridge Engineering Instructor. Congratulations to (left - right) Mike Daniels, CAD; Nate McGovern, Machine Tech. ; Joe Berard, Machine Tech. and their teacher, Thomas Matuszak (not in picture) for winning the Massachusetts State Gold Medal in Automated Manufacturing Technology for McCann Technical High School, in North Adams, Massachusetts. Congratulations to (left - right) Justin Burdick, CAD; Nate Pikula, Machine Tech. ;Collin Murdock, Machine Tech. and their teacher from McCann Technical High School in North Adams, Massachusetts. 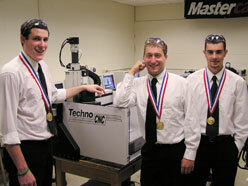 They won theMassachusetts State Gold Medal inAutomated Manufacturing Technology 2007using a Techno Servo DaVinci. We wish them Luck in the National Competition! 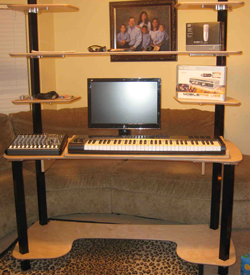 The table to the left, is a MIDI Musical Instrument Digital Interface Desk that teacher, Mark McCollough created for his daughter as a Christmas gift (2008). He used MasterCAM to design the desks' 3D toolpath, and then used a Techno LC Series Model 4896 to machine the wood parts. Mr. McCollough also used a Haas to manufacture all the desks' assembly fixtures. 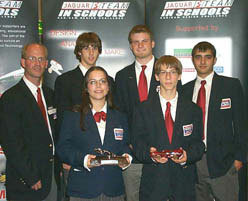 The picture to the left is of the 2008 Team JAG, directed by Mr. Paul Kynerd of Miami Lakes Educational Center, in Miami Lakes, FL. 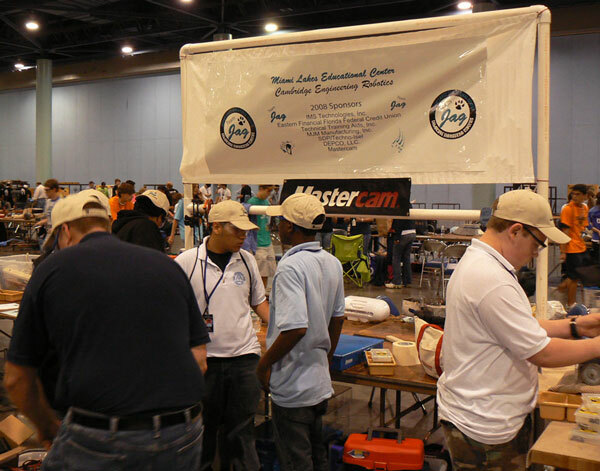 The students were sponsored by Techno, Inc.and Stock Drive Products. 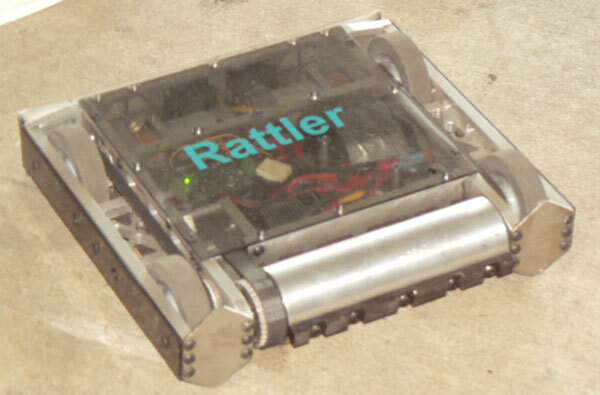 They made the robot using off-the-shelf components fromSDP and designed/fabricated additional parts for the robot using a Techno CNC Servo DaVinci. 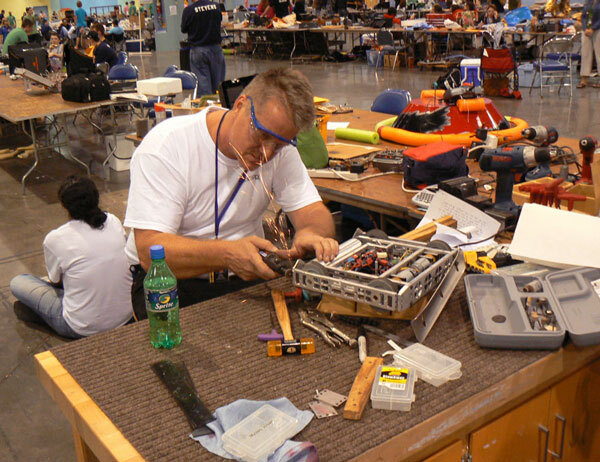 Congratulations to Jeff Lintz and his class atHialeah Middle School for taking FIRST andSECOND place at the Dade County TSA CO2 Competition they used a Techno Servo DaVinci to achieve their successful win! 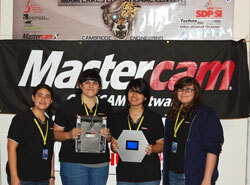 Overall and Fastest Car in the international finals of the Jaguar F1 Team In School CAD/CAM Design Challenge. The team "Turbo" consisted of Alex DeRose, Austin Mantz, Tyler Marshall, Jessica Rubenstein and Justin Wilcott with Team Advisor Kirk Marshall. 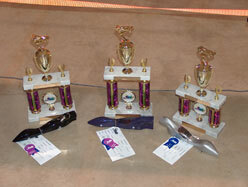 "Turbo" used a Gantry III CNC Router Systemfor this winning project. Congratulations to Mr. Richard Stebbins and his students (left to right) Joseph Kyek, Zack Stebbins, John Saltarelli on winning 1st place in the CT Skills USA competition inAutomated Manufacturing Technology. 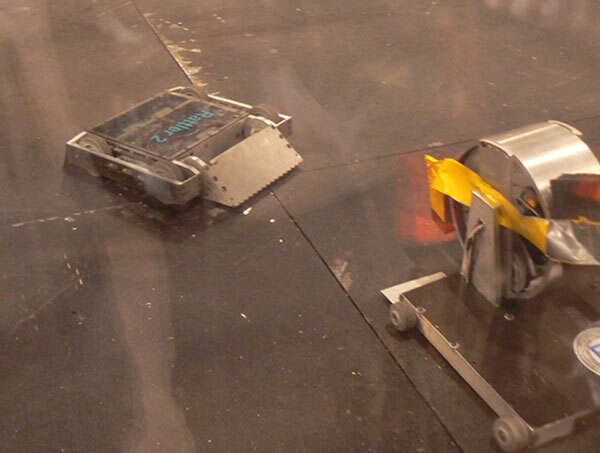 The team will represent CT in the national competition.